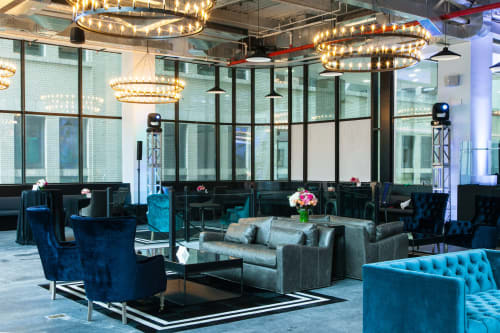 The highly-customizable and spacious interior of The Mezzanine makes it the Financial District’s most stunning event venue. Boasting over 6,300 square feet over 5 rooms, this one-of-a-kind space features floor-to-ceiling windows, beautiful chandeliers, versatile breakout spaces, sleek bleacher-style seating, designer lounge furniture, a state-of-the-art kitchen, and surround-sound audio. The event space is ideal for your large function, corporate events, private showrooms, evening soirees, and much more. Hosted a professionals business conference that lasted 8 hours. The staff on site was very helpful throughout the whole event. The location on Broadway, FiDi has easy subway access and was easy to find for all attendees. The massive windows are an eye-opener.